Some people like their food dry, but I'm all about complementing the flavor and texture with dips and sauces. 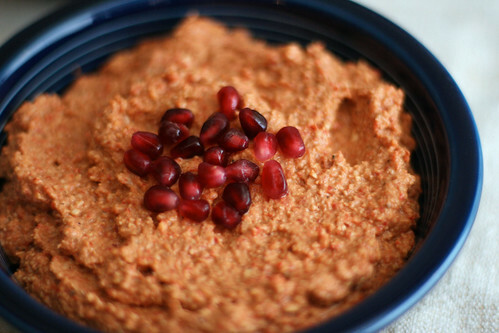 I especially like trying and making new ones, and muhammara is my new favorite. I've been wanting to make this tangy blend of red peppers and walnuts for a long time, and was so excited to have the opportunity during the February Daring Cooks challenge. Use pomegranate molasses unless you absolutely can't find it; that's the key to authenticity here. This dip was definitely the hit of the party, and couldn't be easier to make. You literally throw all of the ingredients in the food processor, give it a whirl, and you're done. What's your favorite dip or sauce? 1. Blend all ingredients except pita chips in processor until coarse puree forms. Season with salt. 2. Transfer to bowl; serve with chips, pita, or veggies. Yum! I will be making this asap! I'm so excited to see all of the other mezze items you made! Ooh - I've never made this before. Aaaand... adding to the list! xo. I love this stuff but I haven't made it yet. Yours looks amazing! Yum!! I made something very similar to this over and over last summer; I couldn't get enough of it! It was a recipe from Gourmet and I think it called for the lemon juice rather than pomegranate molasses. I'm going to see if I can get my hands on some of the pomegranate stuff and make it that way! How have I gone through life without ever making this or trying it? It's going on my list for the next party I have. My friend gave me a recipe for a similar dish with red peppers, almonds, garlic, and lemon, which I love... so I'm sure I would love this too. It looks delicious!! This sounds delicious! The poemgranate seeds and molasses are amazing. I made this a while back for a spa party and it was the hit of the night! I make my own pomegranate molasses and keep it on hand at all times; talk about a good pancake topping! I made BA's version a little while back. I couldn't find pomegranate molasses so I used a reduced pomegranate jelly instead. (I was at Whole Foods - was I just looking in the wrong section?) It was still delicious. This looks a lot more like a hummus than mine did. Bookmarking you for sure! I kept sopping mine up with the pita and licking it off my fingers. I really needed to know what this was because the photo was so enticing... great recipe! What a great recipe-I love the use of roasted red peppers. I can't wait to try this as a dip with some warm naan-yum!